Enlarging a kitchen island became the catalyst for sprucing up the rest of this La Mesa, California hillside home. We created a balance in the kitchen by enlarging the buffet which now serves as a statement piece to the room. 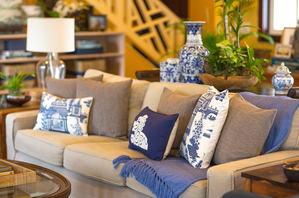 The owners chose a grey tone for the island to anchor the space. Refinishing the hardwood floors in a deep grey tone provided more of a contrast between the existing cabinets. Adding new countertops and glass subway tile provided the sparkle the space needed. New modern hardware finished off the cabinets, while the new coffee themed décor completed the space. The living room was renewed as well starting with a new stone fireplace façade and mantle. A new cabinet was built in to the neighboring niche which was stained in the dark grey matching the kitchen buffet and island. The railing spindles to the downstairs where removed and a glass panel was installed to minimize visual clutter and maintain a clean modern feel. The dining room table was also refinished to a darker tone and the chairs reupholstered refreshing the dining area. The existing window trim was painted white and crown molding topped off the room. View Portfolio page. 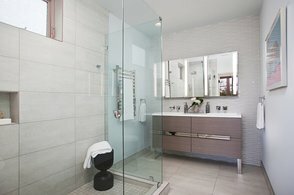 An unfortunate water leak in a Mission Hills, California condo provided the home owner with an opportunity to get the modern bath he’s always wanted. By removing heavy Spanish tiles, a dark vanity and a shower wall, we were able to open up the dim space and create a light and airy master bath. 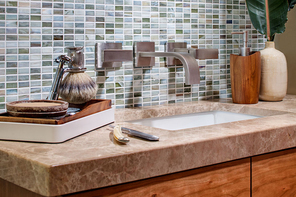 The vanity wall is clad in a wave glass tile adding a shine to the room’s focal point. The Italian-designed floating vanity visually expands the space by revealing additional floor. Extra storage was gained by placing three Robern medicine cabinets with electrical outlets above the vanity. The tub was removed in favor of a glass surround for effortless transition in and out of the shower. The 12 x 24 inch ceramic tile laid in a horizontal stack bond pattern visually widens the room while its matt finish helps avoid spills. A Totto washlet replaced the standard toilet for that ultimate in hygiene while a towel warmer provides that extra comfort expected in a master bath. The ice blue wall tint helps to reflect the natural light adding to the room’s illusion of greater size. Now the remodeled master bath is modern and sophisticated reflecting the home owner’s style. View Portfolio page. ​This Carlsbad, California master bathroom was formerly dark and hampered with divided areas, now with a redesign it has been transformed into a bright open alluring space. The owners wanting to ready the house for resale decided to update the original 1985 room without spending lots of money. To cut cost we kept the original cabinetry and worked with the plumbing locations. By removing a wall and flipping the tub and shower locations we were able to create one large open space. The low soffits that hung above the vanities where removed to add height to the room. The lightly stained cabinets were refinished to a rich dark color and reconfigured to accommodate the reduced wall length. The white tiled counter tops were replaced with granite and a second sink was added for functionality. The sleek new lighting fixtures add a fresh contemporary vibe while the monochromatic color scheme keeps the space feeling timeless. What were once small dark spaces equipped for individual tasks, now is a glamorous airy spa-like retreat suitable for relaxation and rejuvenation, a true master suite. View Portfolio page. The confined 50 sq. ft. bathroom located in Scrips Ranch, California was in dire need of storage and a fresh update. Borrowing the space between wall studs provided several opportunities for additional storage while maintaining its original footprint. One prospect is concealed behind the entry door where two tall custom cabinets were placed. Storage was also obtained by installing two deep recessed medicine cabinets and replacing the pedestal sink with a shallow vanity. The natural cherry cabinet was designed in shaker style to complement the 1994 Craftsman home. Installing a floating toilet provided an additional 8 inches of floor space while eliminating a 9” high shower brim visually expanded the room. A mosaic glass tile wall helps to modernize the space while creating a dynamic focal point. The remodeled bathroom not only provides ample storage but creates a bright modern safe space for years to come. View Portfolio page. By redesigning a contractor grade floor plan we were able to produce an efficient space that resulted in a stylishly new-built home. One of the client’s key objectives was a kitchen with a large inviting feel that incorporate activities and work zones. That was achieved by designing a custom banquette and an office area as well as providing a large island and prep space that incorporated plenty of storage. 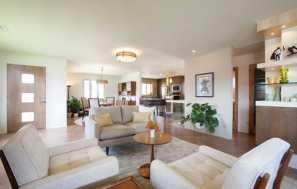 The adjacent open living room includes two French doors providing breath taking views of Oahu’s’ Maunalua Bay. What was once a long L shaped hall has been straighten and reduced allowing for a focal niche that can be seen from the living room. Regaining the square footage from the remaining hallway provided space to create a wheelchair accessible guest bathroom as well as providing a small power room with ample space. View Portfolio page. Eliminating outdated architectural features to this 1950’s split-level ranch modernized the Denver home. Removing walls between three small rooms created an open floor plan with dramatic results. Natural light drawn throughout the first floor, with muted hues helped to enhance the now-bright airy space. A “less is more” approach to furnishings ensured that collected treasures were well displayed while modern built-in cabinets created a worthy home for vintage finds. The original kitchen was modernized with custom Zebrawood cabinetry that visually expands the small space and allows for interaction between guests through enhanced sight lines. The lower level was divided to provide a large master suite and media center, creating both a cozy comfort zone and a haven for relaxing. View Portfolio page. Reconfiguring this 1950’s San Diego ranch-style home produced a more efficient layout, while bargain shopping for the client yielded stylish accessories on a modest budget. Borrowing three feet from an adjacent office space helped to expand the master suite and create a custom bed niche from recycled boat lumber. The narrow master bathroom cleverly notches out space from a large closet to create a dramatic glass-enclosed walk-in shower. 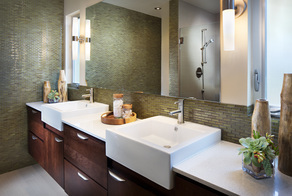 The dual floating mail-order vanities reveal more of the floor, creating the illusion of a wider room, while the earth tone glass tile walls ad sparkle and texture to this masterful suite. Down the hall, the guest bathroom was enlarged by removing two inefficient closets and replacing them with cabinetry for maximized space. A band of tan glass tile circling the room was used to create interest and movement while having a minimal budget impact. View Portfolio Page.